Website editor’s note: The text below is a message from The Nicholas Gonzalez Foundation which has been set up to continue the healing legacy of the late, great Dr.Nicholas Gonzalez. 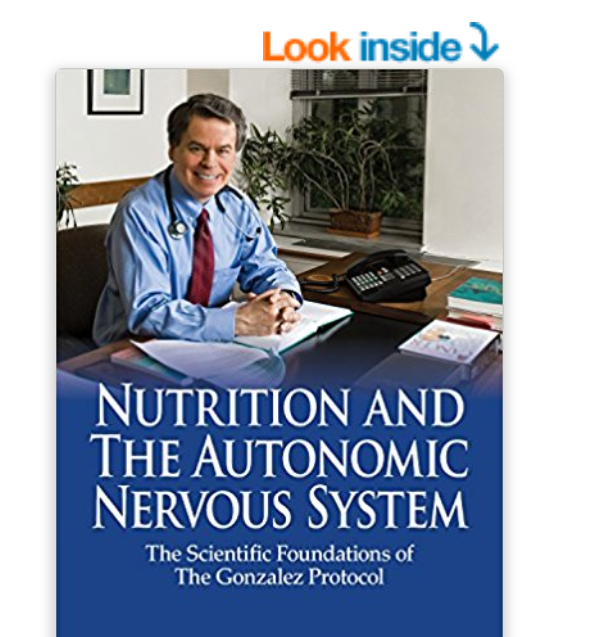 I am currently reading Nutrition and The Autonomic Nervous System – The Scientific Foundations of The Gonzalez Protocol and can vouch for the fact that it is an excellent work that should be part of every health professional’s library. It is also very affordable at the special introductory price of $US 19.95. Dr. Nick Gonzalez’s new book, published posthumously: Nutrition and The Autonomic Nervous System – The Scientific Foundations of The Gonzalez Protocol describes how individual variation in nervous system function means that different individuals require different types of diets (ranging from largely raw food and vegetarian to diets high in fatty red meat, and every variation in between) in order to achieve good health. Similarly, the book explains how different nutrients affect the nervous system and therefore how variation in people’s nervous system function needs to be taken into account when prescribing nutritional supplements. “If you truly care about optimizing your nutrition for optimal health, you need to read this book. This book summarizes decades of scientific research and patient treatments based on the foundational principles of how the autonomic nervous system works. It shows once and for all that we are not alike and there are definite distinctions in autonomic nervous system function between us. Those operating differences influence what foods, supplements and diet are optimal for helping us operate in a healthy, balanced mode. This book explains the different types and provides high level guidance regarding what foods and supplements work for each type. Leave behind any notion you have that there is a “one diet fits all” approach to health. Every wondered by you can tolerate citrus fruits but your friend can’t? Or why you don’t feel well after a heavy meat dinner but your friend can’t live without it? Or why your friend can’t tolerate Magnesium supplements even though they are supposed to be good for you? This book explains why. Available exclusively on Amazon in paperback and Kindle editions – now at the introductory price of just $19.95! NB: The website of The NZ Journal of Natural Medicine includes a review of one of Dr. Gonzalez book One Man Alone, which you may read by clicking HERE and a review of one of his DVDs which you may read by clicking HERE.